LET'S TALK MONEY® IS DESIGNED FOR THE FINANCIAL SERVICES PROFESSIONAL. Let's Talk Money® is a series of customized, client-contact newsletters designed to get your message out and your sales in. Our FINRA-reviewed, turnkey newsletters offer valuable life insurance and financial service content relevant to your customers and prospects. Available in three delivery formats and four versions, Let's Talk Money® helps you stay top-of-mind for life-changing events and establishes you as the trusted financial professional. Combine the personalized, four-page print newsletter with full mailing services. Distribute the personalized PDF to your customers and post it to your website. Click on the picture to see our Standard version in action. The front and the back of the newsletter will be customized to suit your needs. 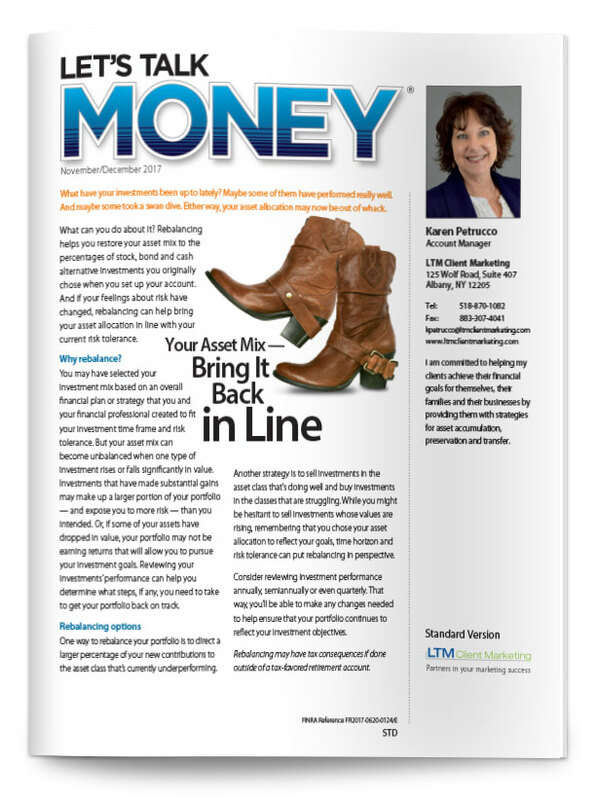 Let's Talk Money® contains new content every other month. The Standard version sample, shown here, focuses on articles of interest to the average investor.